Some time back, I was in the market for a 29 gallon aquarium. The 29 gallon aquarium makes for a standard-sized tank. And I was thinking it should make it easier for me should the need to find replacement parts like lights and hoods arise. But I actually cheated a bit and got a 28 gallon tankinstead. I thought the 1 gallon difference shouldn’t really make that big a difference. And frankly, I neverregretted my decision. What I opted to get over a standard 29 gallon aquarium is the JBJ Nano Cube with LED Intermediate Lighting. It’s a 28-gallon tank and here’s what I think about it. Dimension: 22.5 x 25.5 x 26 inches. Item Model Number: 28G NANO CUBE 29W LED. 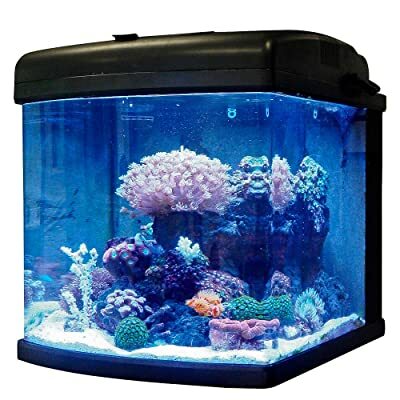 You can’t find an aquarium quite as eco-friendly as the JBJ Nano Cube, 28 or 29 gallon. The new Intermediate series comes with an intense LED lighting system that provides extensive coverage and longer life expectancy. Because of the innovations, the lighting system actually requires less electrical usage. There’s a whole science behind it that covers stuff like PAR (Photosynthetically Active Radiation) but I won’t bore you with the details. Suffice to say the whole things results in decreased energy output. What you really need to know is it saves you money while remaining eco-friendly and keeping the tank operating more coolly. Quite a feat for an aquarium that is also illuminated pretty much the entire day. The cover is lightweight so feeding is a breeze. You can also retrieve water samples without much hassle. No need to raise the entire hood just to do it. JBJ also created a great filtration system that guides the flow of the water directly into the filter media container. The media basket can hold a variety of chemicals to fit your requirements. Cleaning is effortless. All I ever needed to do was raise the basket handle and the water empties out. Actually, I like how the filtration basket is now transparent. It makes for easier refugium conversions. JBJ advices leaving activated carbon within holding chamber 3 with a modest portion of the mechanical sponge just before the water leaves. This is supposed to prevent the algae from clogging the pumps. I did just that and has had to trouble. I was initially worried that the innovative lighting system will heat up my tank. But like I mentioned earlier, that wasn’t so. The cover of this aquarium houses a lightweight aluminum heat sink that dissipates temperature quickly. The canopies are of a flame retardant plastic material. The cooling fans switch on and off together with the primary lights. Also included is a thermal protector. This automatically turns the lights off if the fans suddenly stop working. But I think my favorite part of the JBJ Nano Cube is the wavemaker. It creates currents within the aquarium to make for a healthy reef environment. I honestly think my fish love it, too. The JBJ Nano Cube is a great tank, even if it’s not your standard 29 gallon aquarium. The only downside to it is my moon lights go out when the water splashes on it. I’m not sure if it’s just my tank or if this is a common issue with all JBJ Nano Cubes. Lights go out when splashed with water.